Have you ever just listened to the rain when you were relaxing and noticed how soothed you felt? Or, have you ever been on a stream when the sun is just coming up and only you and the Lord have that special time together? That is a time when your heart is opened to the silent sounds of God's voice speaking to you. The music of the mountains are like that. 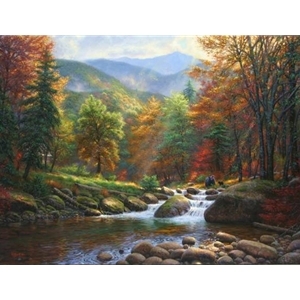 You have to be quiet and listen to the rustle of the leaves, the chirping of the birds, and the rushing mountain stream. These are the sounds that echo to your heart. I hope someday that you will have the opportunity to "hear" the solitude and God's quietness in the Mountain Music.